After a bunch of traveling, including a fairly hellish congested stretch of 295 et al. through Connecticut, Massachusetts and New Hampshire and some of the heaviest rain I 've seen in a while, Caolan and Sophia and I are settled in a small cottage a few hundred yards from the ocean on Peaks Island, just offshore from Portland. The ferry ride though brief was fog-bound and cold and even now the leaves in the oaks around the cottage are dripping with condensed moisture. 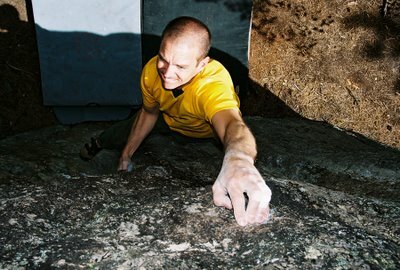 Although it seems an unlikely spot to think about climbing, the Maine Rock gym is a ferry ride and a short drive away and interestingly a stone's throw from Whole Foods, just like the gyms in Boulder. And on the island itself, I am wondering about this wall; here is a photo I took last year. It's very similar to the rock at Fort Williams in Cape Elizabeth and should provide a few sessions of interest, especially the wall on the right side of the photo. I grew up across the bay in South Portland and started climbing near there so in several senses it is a return to my roots. so ... did u do that line or not?